Scott Renbarger is a fine geologist and we’re proud to count him as an Outspire guide. You can read more about Scott on the Outspire website. When you look west from Santa Fe, possibly admiring one of our famous sunsets, the scene is framed below by the lovely, rounded blue mountains of the Jemez, far off on the horizon. What you probably don’t notice is the low range of dark hills just below these mountains, a seemingly insignificant feature in the overall drama of the Santa Fe landscape. But like that quiet, mousy person that everyone overlooks at the party, these little cerrillos conceal a surprisingly turbulent history. 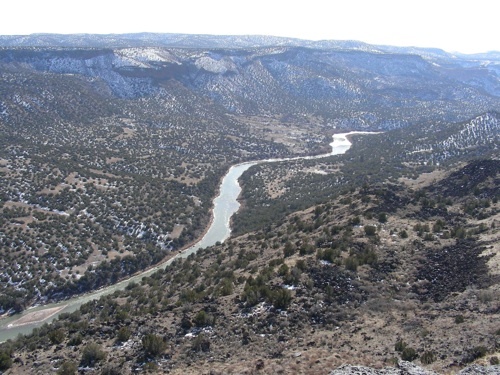 They’re called the Cerros del Rio, the river hills, because the Rio Grande cuts through their western flank, boxed in between the hills and the Jemez Mountains. In fact the more common name for this area is the Caja del Rio, the river box, or simply the Caja. The Rio Grande has carved a wide canyon, White Rock Canyon, rimmed by dark basalt, between the two volcanic fields of the Caja and the Jemez. With only a very few easily accessible places to see this cleft, the canyon may be the most overlooked physical feature in Northern New Mexico. Its side canyons reveal cross-sections of volcanic activity so spectacular that volcanologists come from all over the world to raft in and examine them. Otherwise only the rattlesnake and the coyote enjoy its remote beauty. 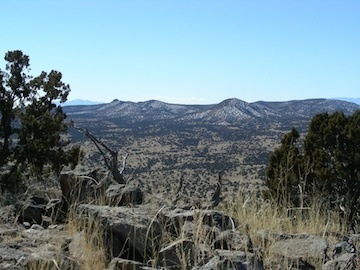 The hills east of the river have been taken under the umbrella of the Santa Fe National Forest and are accessible to the public, although no maintained trails thread its peaks. Only a rough and confusing network of dirt roads takes the adventurer back into the arid landscape of the Caja. Many people would wonder where the forest actually is. 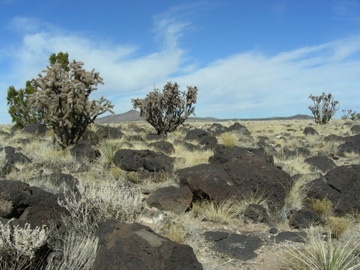 The Caja is thinly vegetated by pinyon and juniper trees with a grassland biome dominating, spiced with a variety of cold-hardy cactus. It looks like savannah rather than forest. 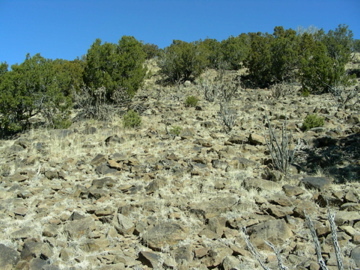 Since the Forest Service permits cattle grazing and wood cutting in the Caja, the vegetation in the hills has the sadly familiar abused look of many Western open spaces. But these dry hills conceal a hidden treasure of geologic history. As you’ve probably gathered from earlier remarks, the Caja is the expression of volcanic activity. It is no longer active and not a single hot spring sends up a plume of steam to give a hint of its old passions but not long ago, eruption after eruption covered the landscape along the Rio Grande with flows of molten lava, punctuated by low cones spewing incandescent clots of lava high into the air. From time to time these flows actually dammed the river, forming lakes that could cover the town of Espanola, had it been there a couple of million years ago. The Caja is a textbook example of what geologist call a volcanic field. Around 60 vents have been identified within its boundaries, all erupting between 2.6 to 1.1 million years ago. Geologically speaking, this is not old at all. 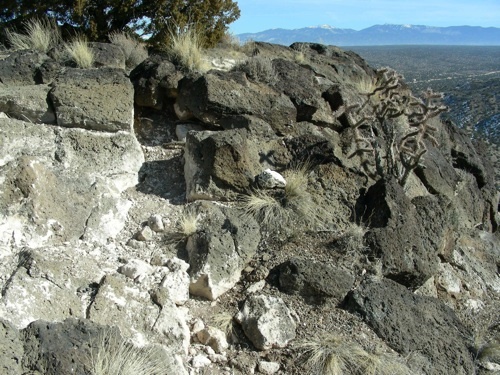 The lavas thicken toward the Rio Grande hinting at the presence of a through-going drainage, and close to the modern river there are unmistakable signs of the violent interaction of hot magma penetrating wet mud, sand, and gravel, with steam explosions blasting wide craters in the ancient river sediments. Most of the eruptions in the Caja were not nearly as violent as these so-called phreatomagmatic eruptions must have been. The lavas of the Cerros del Rio volcanic field fall into a relatively limited range of compositions, from basalt, to basaltic andesite, to andesite, rocks full of dark dense minerals that melt at high temperatures. For lavas, they are also low in silica, that combination of oxygen and silicon common to all magma. These factors meant that the lavas of the Caja exited the crust relatively gently, in effusive eruptions, and spread freely, only occasionally belching up some undigested gas to build up cinder cones. The influence of silica content on the behavior of volcanic eruptions and lava flows is remarkably illustrated in the Caja. Molten basalt has the lowest silica content of the lavas erupted here. It melts at the highest temperature as well, and its flows are flat, relatively thin, and wide ranging, forming the platform that builds up the bulk of the field. Many of these flows are only 10 to 15 feet thick. Others of a more mixed composition are as much as 90 feet thick. Gas bubbles frozen into the basalt, trapped before they could escape, form the common scoriaceous or vesicular texture of these dark, blackish-grey rocks. 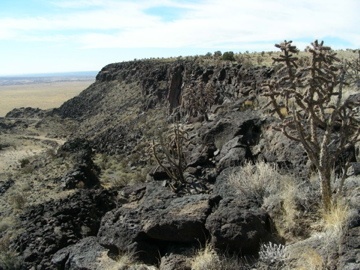 Molten andesite has a higher silica content than basalt and its eruptions here formed stubby flow-domes that look like flat-topped mesas with steep rubbly sides, averaging 200 feet in thickness. From far above they look like pudgy multi-lobed spills of candle wax. An analogy to this contrasting behavior would be the difference between maple syrup spreading out on your plate, compared to the pancake spreading out in the frying pan. Andesite weathers into a softer brown color than basalt and does not have the white caliche crusts that eroding basalt has, giving you another way of telling them apart. In places multiple flows of basalt erupted from a common vent, building up low broad cones called shields, and in other places gas ventilating from erupting basalt fragmented the lava into foamy clots that piled up into steep-sided cinder cones. These landforms add variety to the hills of the Caja, and together with the lava flows, flow-domes, and phreatomagmatic craters, make these unremarkable hills a remarkable showplace of volcanic activity. 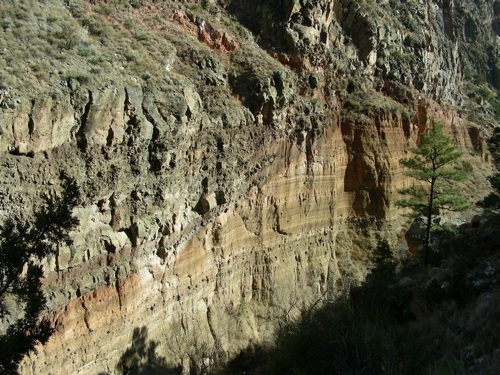 When you add this to the fact that the southeastern side of the field is broken off by a large fault in the Earth’s crust – La Bajada – and that the northwestern side has been cut by a canyon of the Rio Grande – White Rock Canyon, you find that geologists have ways of actually looking into the volcanic field, as well as over its surface. This makes the Cerros del Rio volcanic field even more attractive for students of the Earth’s history. And a place well worthy of exploring with a carefully chosen hike. This entry was posted in Nature&history. Bookmark the permalink.